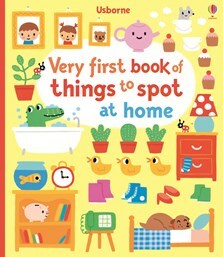 A colourful and chunky book full of busy scenes around the house, with friendly illustrations and lots to look for, spot and talk about on every page. Children can spot the spaghetti and find a cheeky mouse in the kitchen, match up the pets with their bowls of food at dinner time and see who’s hiding under the bed in a busy bedroom. A delight to share with little children, this book will help them learn new words and develop vital pre-reading skills.